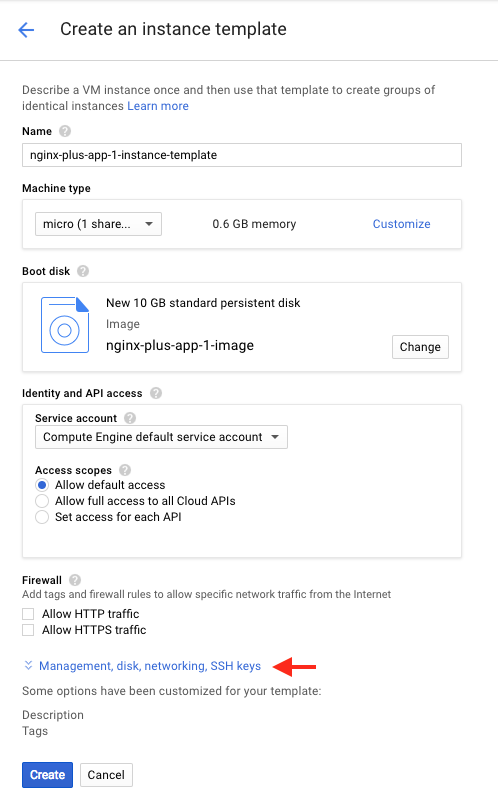 This deployment guide explains how to create and configure the initial components for an all‑active, high‑availability deployment of NGINX Plus on Google Compute Engine (GCE), the Google Cloud Platform (GCP) product for running workloads on virtual machines (VMs). Multiple instances of NGINX Plus in active pairs load balance incoming connections across multiple application environments. GCE is a highly dynamic environment where the names and arrangement of GUI elements (such as menu items, checkboxes, and configuration navigation) are subject to change. We have made every effort to accurately represent the GCE GUI at the time of original publication, but options and locations might change over time. Use this guide as a reference and adapt to the current GCE working environment as necessary. The configuration described in this guide allows anyone from any public IP address to access the NGINX Plus instances directly without restriction. While this most flexibly accommodates common scenarios in a test environment, we do not recommend it for production use. Before deploying the architecture in production, we strongly recommend that you disable HTTP and HTTPS access to the app-1 and app-2 instances over the GCE external IP addresses, or remove the external IP addresses for all application instances so that they’re accessible only on the internal GCE network. NGINX Plus – Load balances HTTP connections across multiple instances of two different applications. Instructions are provided both for manual installation on a standard GCE VM image and for setting up the prebuilt NGINX Plus VM image available in the Google Marketplace. PHP-FPM – Supports the two sample applications. 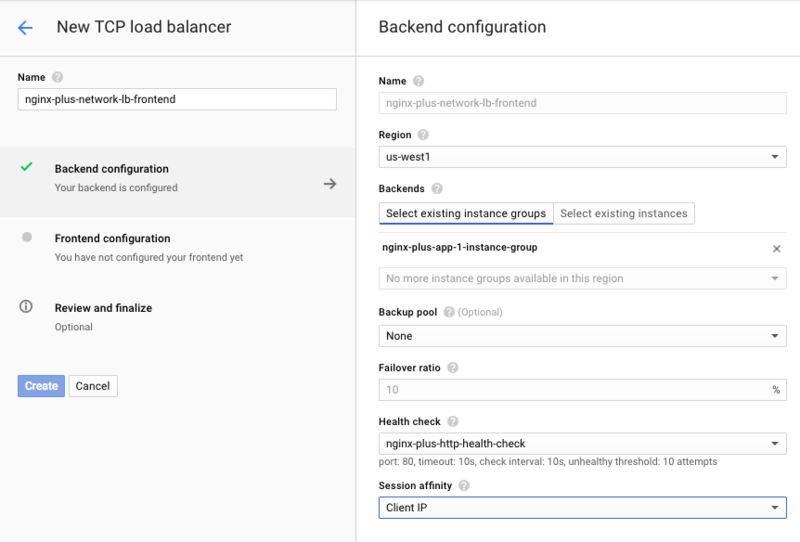 GCE network load balancer – Provides TCP connectivity between clients and the NGINX Plus load‑balancing (LB) instances in a GCP region, as well as maintaining session persistence for each NGINX Plus instance. GCE instance groups – Provide a mechanism for managing a group of VM instances as a unit. 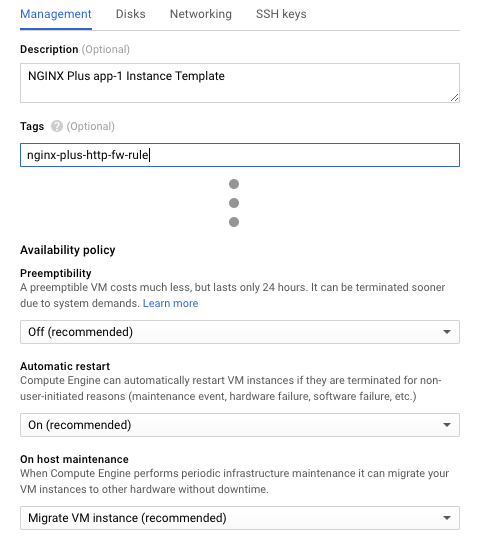 GCE health checks – Maintain high availability of the NGINX Plus LB instances by controlling when GCE creates a new LB instance in the instance group. Session persistence is managed at the network layer by GCE network load balancer (based on client IP address) and at the application layer by the NGINX Plus LB instance (via a session cookie). 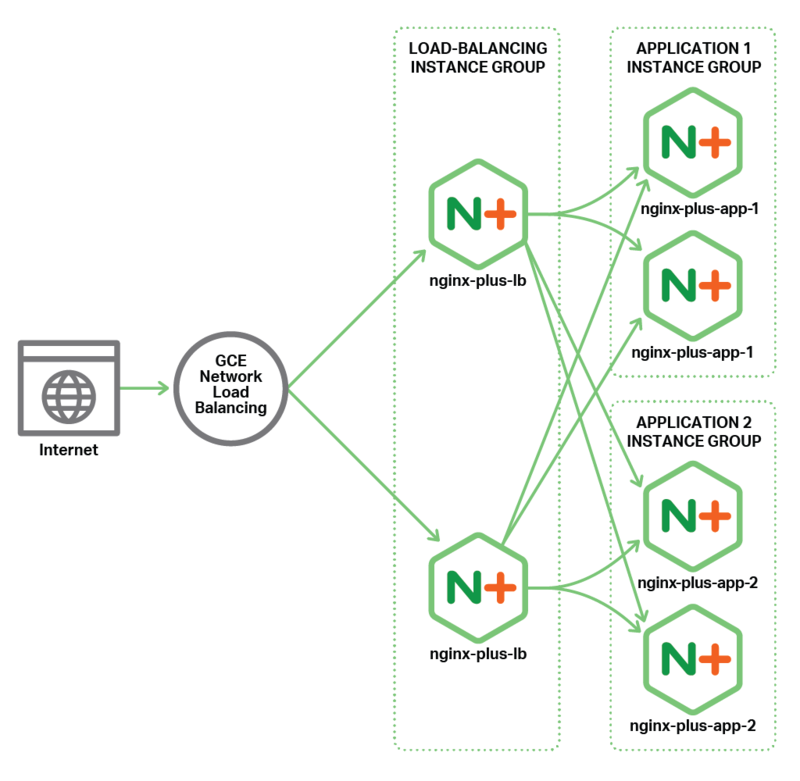 When a new client connection enters the GCE network environment, GCE network load balancer assigns it to a specific frontend NGINX Plus LB instance, and the association persists as long as the LB instance is up and functional. The NGINX Plus LB instance forwards the request to a specific application instance in one of the two groups of them, selected using its default Round Robin algorithm. It also issues a cookie to the client to represent the session with that application instance, so that subsequent requests from the client are forwarded to that application instance as long as it is up and running. This deployment in this guide utilizes two groups of application instances – app-1 and app-2 – to demonstrate load balancing between different application types, but the application configurations are the same in both groups. The deployment can be very easily adapted to distribute unique connections to different groups of application instances by creating discrete upstream blocks and doing content routing based on URI. Please refer to the reference documentation for details on configuring multiple upstream server groups. Have a Google account (a separate GCP or GCE account is not needed). Have enrolled in a free trial with available credit or have an established payment account with GCP. Have an NGINX Plus subscription. You can start a free 30-day trial if you don’t already have a paid subscription. Know how to install NGINX Plus, have a basic understanding of how it performs in load balancing and application delivery modes, and are familiar with its configuration syntax. Are familiar with GitHub and know how to clone a repository. All component names – projects, instances, templates, instance groups, and so on – are examples only. You can change them as suits your needs. 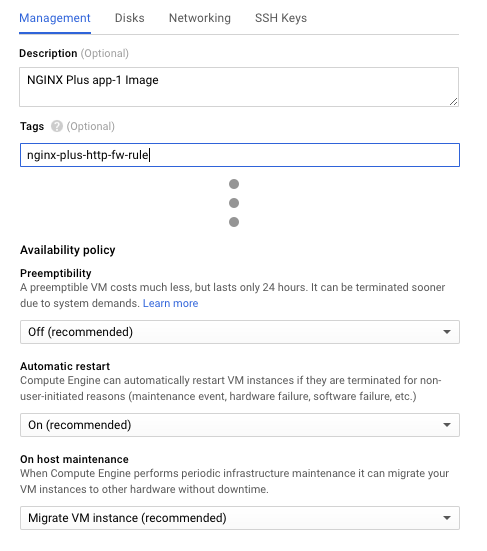 Create a new GCE project to host the all‑active NGINX Plus deployment. Log into the GCP Console at console.cloud.google.com. The GCP Home > Dashboard tab opens. Its contents depend on whether you have any existing projects. If there are no existing projects, click the Create a project button. If there are existing projects, the name of one of them appears in the upper left of the blue header bar (in the screenshot, it’s My Test Project ). Click the project name and select Create project from the menu that opens. Type your project name in the New Project window that pops up, then click CREATE. We’re naming the project NGINX Plus All-Active-LB. 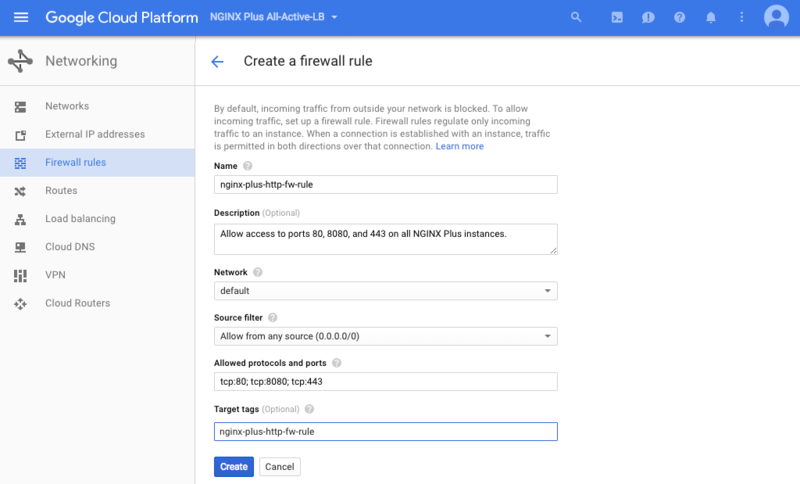 Create firewall rules that allow access to the HTTP and HTTPS ports on your GCE instances. You’ll attach the rules to all the instances you create for the deployment. Source filter – On the drop-down menu, select either Allow from any source (0.0.0.0/0), or IP range if you want to restrict access to users on your private network. In the second case, fill in the Source IP ranges field that opens. In the screenshot, we are allowing unrestricted access. Note: As mentioned in the introduction to this guide, opening these ports for your application instances is appropriate only in a test environment. We strongly recommend that before deploying the architecture in production you create a new firewall rule for your application instances that blocks all port access to the external IP address, or disable external IP addresses for the instances to make them accessible only on the internal GCE network. Click the Create button. The new rule is added to the table on the Firewall rules tab. Create three GCE source instances that will serve as templates for the instance groups you will create later on: one instance for the NGINX Plus load balancer and two instances for NGINX Plus PHP application servers. Based on a standard GCE VM image, in which case you install NGINX Plus manually. This guide uses the Ubuntu LTS image that was most current at the time of publication (Ubuntu 16.04 LTS), but you can use any Unix or Linux OS that NGINX Plus supports. Based on the prebuilt NGINX Plus image in the Google Marketplace, which at the time of publication runs on Ubuntu 14.04 LTS. The instructions for the two methods are significantly different, but after you create the source instances all subsequent instructions are the same. Create three source VM instances based on a GCE VM image. We’re basing our instances on the Ubuntu 16.04 LTS image. 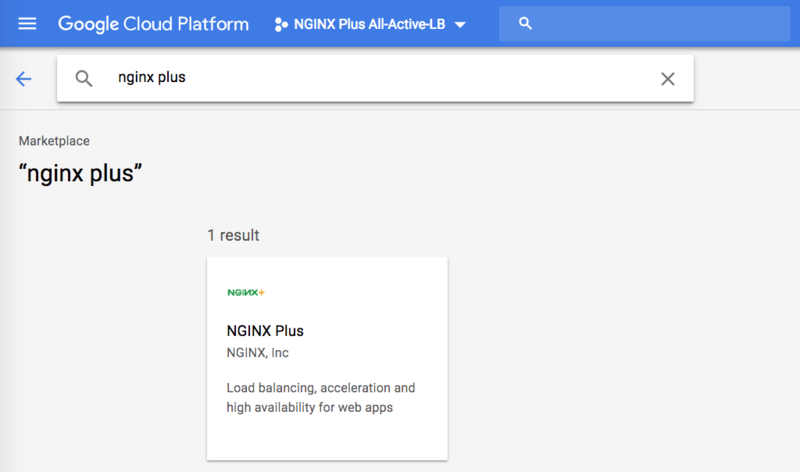 Verify that the NGINX Plus All-Active-LB project is still selected in the Google Cloud Platform header bar. Navigate to the Compute Engine > VM instances tab. Click the Create instance button. The Create an instance page opens. Zone – The GCP zone that makes sense for your location. We’re using us-west1-a. Machine type – The appropriate size for the level of traffic you anticipate. We’re selecting micro, which is ideal for testing purposes. Click the radio button for the Unix or Linux image of your choice (here, Ubuntu 16.04 LTS). Accept the default values in the Boot disk type and Size (GB) fields (Standard persistent disk and 10 respectively). Identity and API access – Unless you want more granular control over access, keep the defaults for the Service account field (Compute Engine default service account) and Access scopes radio button (Allow default access). Firewall – Verify that neither check box is checked (the default). The firewall rule invoked in the Tags field on the Management subtab (see Step 3 below) controls this type of access. On the Disks subtab, uncheck the checkbox labeled Delete boot disk when instance is deleted. On the Networking subtab, verify the default settings, in particular Ephemeral for External IP and Off for IP Forwarding. If you are using your own SSH public key instead of the default keys associated with your GCE identity, on the SSH Keys subtab paste the hexadecimal key string into the box that reads Enter entire key data. Click the Create button at the bottom of the Create an instance page. The VM instances summary page opens. It can take several minutes for the instance to be created. Wait to continue until the green check mark appears. On the VM instances summary page, click CREATE INSTANCE. Install and configure PHP and FastCGI on the instances. Repeat these instructions for all three source instances (nginx-plus-app-1, nginx-plus-app-2, and nginx-plus-lb). In the instance’s row in the table, click the triangle icon in the Connect column at the far right and select a method (for example, Open in browser window). Working in the SSH terminal, install PHP 7 (the default PHP version for Ubuntu 16.04 LTS) and FastCGI. Leave the SSH connection open for reuse in the next section. Both the configuration and content files are available at the NGINX, Inc. GitHub repository. Install NGINX Plus. For instructions, see the NGINX Plus Admin Guide. On both nginx-plus-app-1 and nginx-plus-app-2, copy gce-all-active-app.conf. On the LB instance (nginx-plus-lb), use your preferred text editor to open gce-all-active-lb.conf and change the server directives in the upstream block to reference the internal IP addresses of the nginx-plus-app-1 and nginx-plus-app-2 instances (substitute the address for the expression in angle brackets). No action is required on the two application instances themselves. You can look up internal IP addresses in the Internal IP column of the table on the Compute Engine > VM instances summary page. Rename default.conf to default.conf.bak so that NGINX Plus does not load it. The configuration files provided for the all‑active deployment include equivalent instructions plus additional function‑specific directives. Enable the NGINX Plus live activity monitoring dashboard for the instance by copying status.html from the etc_nginx_conf.d subdirectory of the cloned repository to /etc/nginx/conf.d. Verify the instance is working by accessing it at its external IP address. (As previously noted, we recommend blocking access to the external IP addresses of the application instances in a production environment.) The external IP address for the instance appears on the Compute Engine > VM instances summary page, in the External IP column of the table. Access the index.html page either in a browser or by running this curl command. Proceed to Task 3: Creating “Gold” Images. 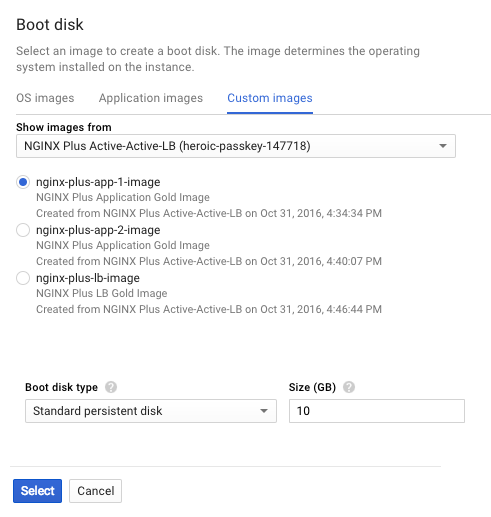 Create three source instances based on a prebuilt NGINX Plus image running on Ubuntu 14.04 LTS, available in the Google Marketplace. Google requires that you provision the first instance in the GCP Marketplace. Then you can clone the additional two instances from the first one. 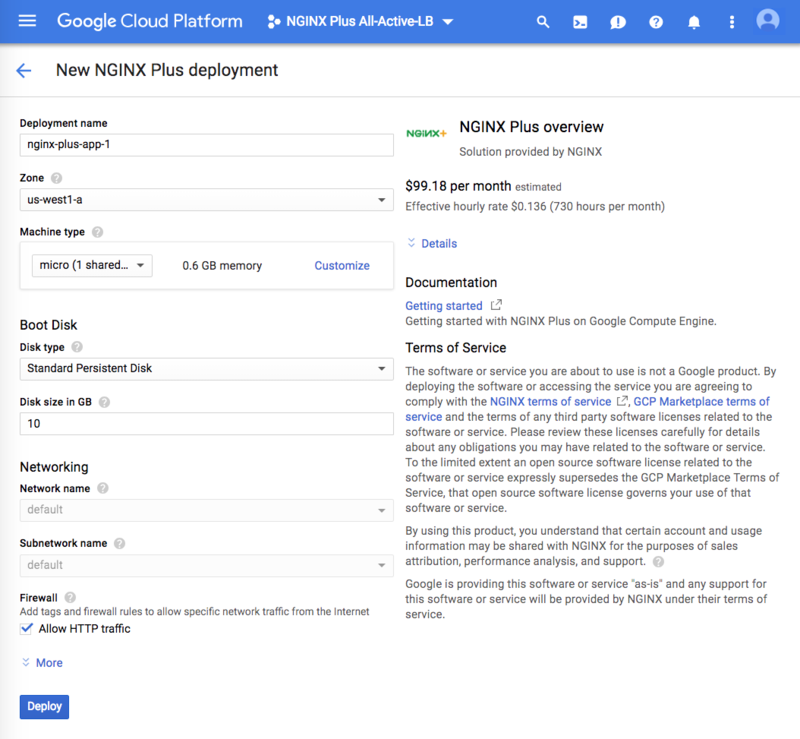 Navigate to the GCP Marketplace and search for nginx plus. Click the NGINX Plus box in the results area. On the NGINX Plus page that opens, click the Launch on Compute Engine button. Fill in the fields on the New NGINX Plus deployment page as indicated. Firewall – Verify that the Allow HTTP traffic checkbox is checked. It can take several minutes for the instance to deploy. Wait until the green check mark and confirmation message appear before continuing. On the VM instances page that opens, click EDIT at the top of the page. In fields that can be edited, the value changes from static text to text boxes, drop‑down menus, and checkboxes. Tags – If a default tag appears in the field (for example, nginx-plus-app-1-tcp-80), click the X after its name to remove it, and type in nginx-plus-http-fw-rule. 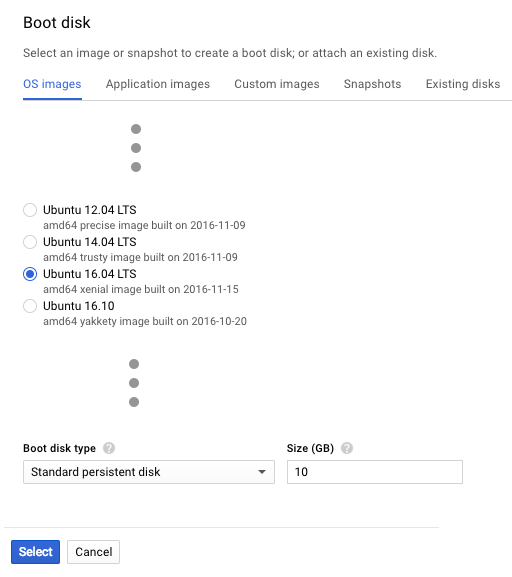 Boot disk and local disks – Uncheck the checkbox labeled Delete boot disk when when instance is deleted. Network – We recommend keeping the default settings, but if you need to change them (if, for example, you’re configuring a production environment), click default and then EDIT on the Network details page that opens. After making your changes click the Save button. Firewall – Verify that neither check box is checked (the default). The firewall rule named in the Tags field that’s above on the current page (see the first bullet in this list) controls this type of access. SSH Keys – If you are using your own SSH public key instead of the default keys associated with your GCE identity, paste the hexadecimal key string into the box that reads Enter entire key data. Serial port – Verify that the check box labeled Enable connecting to serial ports is not checked (the default). The screenshot shows the results of your changes, omitting some fields than cannot be edited or for which we recommend retaining the defaults. Create the second application instance by cloning the first one. Navigate back to the summary page on the Compute Engine > VM instances tab (click the arrow that is circled in the following figure). Click nginx-plus-app-1-vm in the Name column of the table (shown in the screenshot in Step 7 of Creating the First Application Instance). On the VM instances page that opens, click CLONE at the top of the page. Name – nginx-plus-app-2-vm. Here we’re adding the -vm suffix to make the name consistent with the first instance; GCE does not add it automatically when you clone an instance. Machine type – The appropriate size for the level of traffic you anticipate. We’re selecting f1-micro, which is ideal for testing purposes. Identity and API access – Set the Access scopes radio button to Allow default access and accept the default values in all other fields. If you want more granular control over access than is provided by these settings, modify the fields in this section as appropriate. Firewall – Verify that neither check box is checked (the default). Click Management, disk, networking, SSH keys to open that set of subtabs. Create the source load‑balancing instance by cloning the first instance again. Repeat Steps 2 through 7 of Creating the Second Application Instance. In Step 4, specify nginx-plus-lb-vm as the name. Repeat these instructions for all three source instances (nginx-plus-app-1-vm, nginx-plus-app-2-vm, and nginx-plus-lb-vm). In the row for the instance in the table, click the triangle icon in the Connect column at the far right and select a method (for example, Open in browser window). The screenshot shows instances based on the prebuilt NGINX Plus images. Working in the SSH terminal, install PHP 5 (the default PHP version for Ubuntu 14.04 LTS) and FastCGI. On both nginx-plus-app-1-vm and nginx-plus-app-2-vm, copy gce-all-active-app.conf. Create gold images, which are base images that GCE clones automatically when it needs to scale up the number of instances. They are derived from the instances you created in Creating Source Instances. Before creating the images, you must delete the source instances to break the attachment between them and the disk (you can’t create an image from a disk that’s attached to a VM instance). Click STOP in the top toolbar to stop the instances. Click DELETE in the top toolbar to delete the instances. In the Boot disk and local disks field, uncheck the checkbox labeled Delete boot disk when when instance is deleted. On the VM instances summary page, select the instance in the table and click DELETE in the top toolbar to delete it. Navigate to the Compute Engine > Images tab. Verify that the three images appear at the top of the table on the Compute Engine > Images tab. Create instance templates, which are the compute workloads that are created in instance groups, either manually or automatically when GCE detects a failure. Navigate to the Compute Engine > Instance templates tab. Click the Create instance template button. Open the Custom Images subtab. Select NGINX Plus All-Active-LB from the drop-down menu labeled Show images from. Click the nginx-plus-app-1-image radio button. Identity and API access – Unless you want more granular control over access, keep the defaults in the Service account field (Compute Engine default service account) and Access scopes field (Allow default access). Firewall – Verify that neither check box is checked (the default). The firewall rule invoked in the Tags field on the Management subtab (see Step 6 below) controls this type of access. Click Management, disk, networking, SSH keys (indicated with a red arrow in the following screenshot) to open that set of subtabs. On the Disks subtab, verify that the checkbox labeled Delete boot disk when instance is deleted is checked. Instances created from this template are ephemeral instantiations of the gold image, so we want GCE to reclaim the disk when the instance is terminated. New instances are always based on the gold image, so there is no reason to have the instantiations persist on disk when the instance is deleted. On the Networking subtab, verify the default settings of Ephemeral for External IP and Off for IP Forwarding. On the Instance templates summary page, click CREATE INSTANCE TEMPLATE. 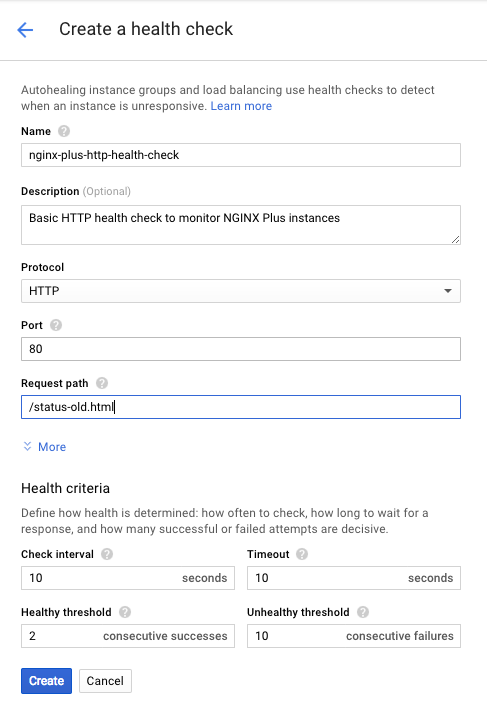 Define the simple HTTP health check that GCE uses to verify that each NGINX Plus LB image is running correctly (and to re-create an LB instance that is not running correctly). Navigate to the Compute Engine > Health checks tab. Click the Create a health check button. If the Health criteria section is not already open, click More. Create three independent instance groups, one for each type of function-specific instance. Navigate to the Compute Engine > Instance groups tab. Click the Create instance group button. Click the Single-zone radio button (the default). 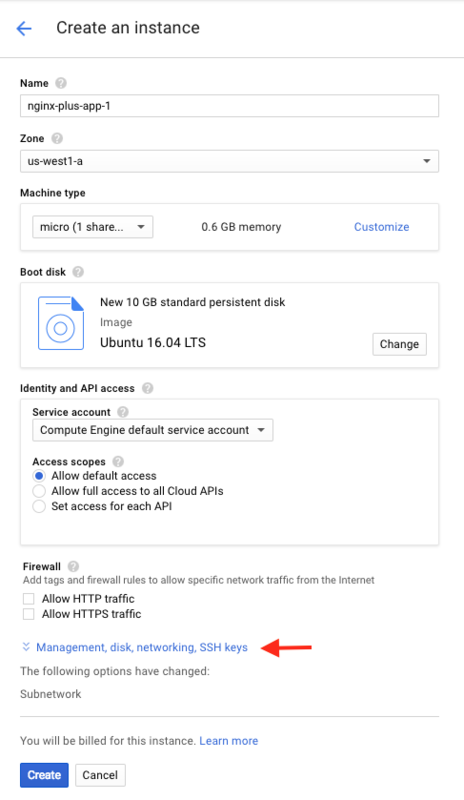 Zone – The GCP zone you specified when you created source instances (Step 1 of Creating the First Application Instance from a VM Image or Step 5 of Creating the First Application Instance from a Prebuilt Image). We’re using us-west1-a. On the Instance groups summary page, click CREATE INSTANCE GROUP. 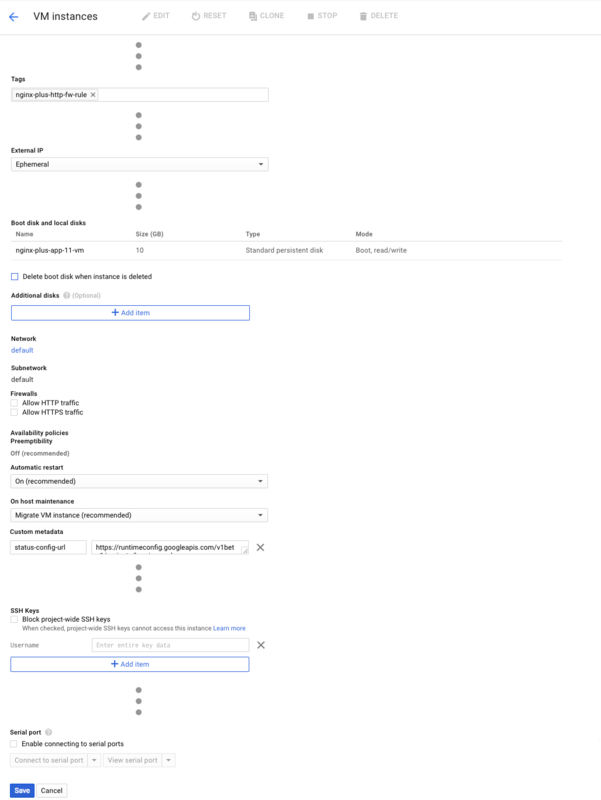 Update the NGINX Plus configuration on the two LB instances (nginx-plus-lb-instance-group-[a...z]) to list the internal IP addresses of the four application servers (two instances each of nginx-plus-app-1-instance-group-[a...z] and nginx-plus-app-2-instance-group-[a...z]). Repeat these instructions for both LB instances. Verify that the four application instances are receiving traffic and responding, by accessing the NGINX Plus live activity monitoring dashboard on the load‑balancing instance (nginx-plus-lb-instance-group-[a...z]). 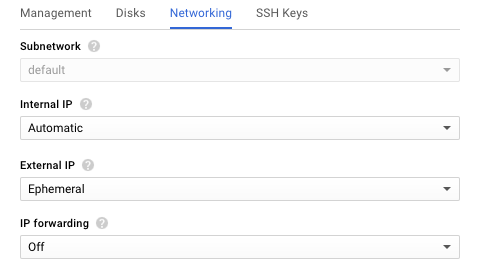 You can look up the instance’s external IP address on the Compute Engine > VM instances summary page, in the External IP column of the table. If load balancing is working properly, the unique Server field from the index page for each application instance appears in turn. 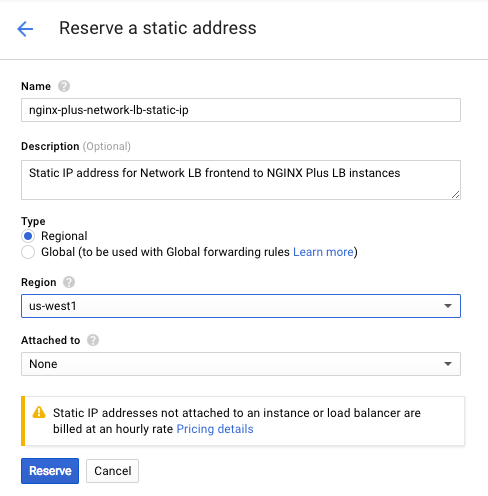 Set up GCE network load balancer to distribute incoming client traffic to the NGINX Plus LB instances. The first step is to reserve the static IP address that GCE network load balancer advertises to clients. Navigate to the Networking > External IP addresses tab. Click the Reserve static address button. 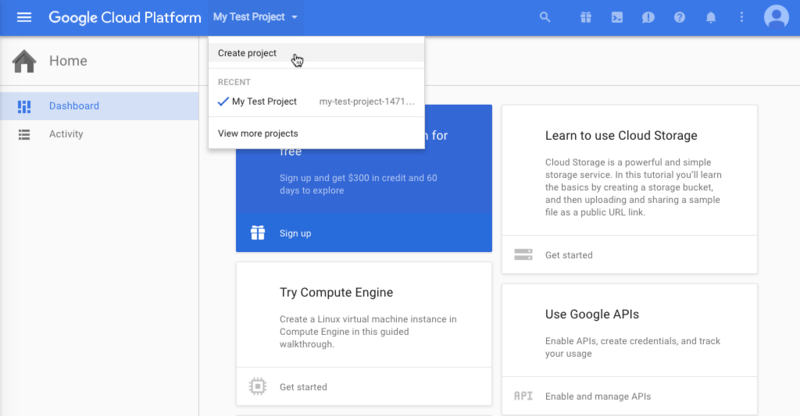 Region – The GCP zone you specified when you created source instances (Step 1 of Creating the First Application Instance from a VM Image or Step 5 of Creating the First Application Instance from a Prebuilt Image). We’re using us-west1. Navigate to the Networking > Load balancing tab. Click the Create load balancer button. On the Load balancing page that opens, click Start configuration in the TCP Load Balancing box. On the page that opens, click the From Internet to my VMs and No (TCP) radio buttons (the defaults). Click the Continue button. The New TCP load balancer page opens. In the Name field, type nginx-plus-network-lb-frontend. Region – The GCP region you specified in Step 4. We’re using us-west1. Click Frontend configuration in the left column to open the Frontend configuration interface in the right column. Verify that GCE network load balancer is properly routing traffic to both NGINX Plus LB instances. Verify that with one LB instance offline, the other LB instance still forwards traffic to the application instances (there might be a delay before GCE network load balancer detects that the first instance is offline). Continue monitoring and verify that GCE network load balancer then re-creates the first LB instance and brings it online.